Interview by Daria Tuminas about The two headed horse. Reenactment in ten acts at Unseen Platform. Interview by Mike Sakasegawa for Keep the channel open: Podcast Episode No. 85. Moisés, part of the Who is looking at family, now? exhibition in Photo50, featured in FT Weekend Magazine, December 2018. Moisés reviewed by Socorro Venegas, Literal Magazine, June 2018. Interview by Stefan Vanthuyne for Belgian Platform for Photobooks, May 2018. Interview by BLOW PHOTO, May 2018. Moisés in Landscape Stories, April 2017. Moisés in KONBINI, March 2017. Moisés photobook included in Understanding Photoboks by Jörg Colberg, October 2016. Moisés reviewed by Jon Uriarte in THE PHOTOBOOK REVIEW, Issue 10, Spring 2016. Interview about Moisés for PHOTOWHOA's Blog. In conversation with Jessa Fairbrother for the Photobook Bristol. Moisés featured in Revista Vísperas, Spain / February 2016. Moisés featured in SLATE Magazine / January 2016. Moisés featured in FISHEYE Magazine / January 2016. Interview published in The Guardian / July 2015. Moisés reviewed by Erik Kessels in Photobookstore Magazine / July 2015. Moisés featured in Revista Ojos Rojos / July 2015. British Journal of Photography online / June 2015. Moisés featured in OjodePez Magazine Issue 41 / June 2015. Moisés featured in ELSE Magazine presented by Erik Kessels, Issue 9, Musée de l'Elysée / June 2015. Moisés included in the 7 best things at PHotoEspaña 2015 by The Telegraph. Honored to be included in the list of the 9 mexican photographers to follow, TIME Magazine/ May 2015. Moisés in PHOSMAG / April 2015. Interview Photographic Museum of Humanity / February 2015. British Journal of Photography, ONES TO WATCH Issue / January 2015. VOICES of PHOTOGRAPHY Magazine, selected by Larissa Leclair, Issue 14 / January 2015. FK Magazine / January 2015. SuperMassiveBlackHole Magazine, Issue 17 / Septembre 2014. PÁGINA 12, Interview LAS 12 / September 2014. LAT PHOTO MAGAZINE, curated by Arianna Rinaldo, September 2014. British Journal of Photography, England / July 2014. Clarín, Revista VIVA, Argentina / July 2014. EL PAÍS, Mexico, Spain / June 2014. AI-AP Dispatches from Latin America, Septembre 2014. CENTRO de la IMAGEN Blog, Mexico, September 2014. PARATY EM FOCO, Brazil/ June 2014. La Razón Newspaper, Mexico/Mayo 2014. TEATRO Magazine from Centro Cultural del Teatro SAN MARTÍN, Issue 115/August 2013. LAT PHOTO MAGAZINE, Issue no. 1/ Identity, curated by Alejandro Castellote. PICNIC Magazine: Travelers, December/January 2013. Tonica Magazine, El Debate Newspaper, November 11, 2012. F-Stop Magazine: Latin America Issue, August/September 2012. Fototazo, March and September 2012. 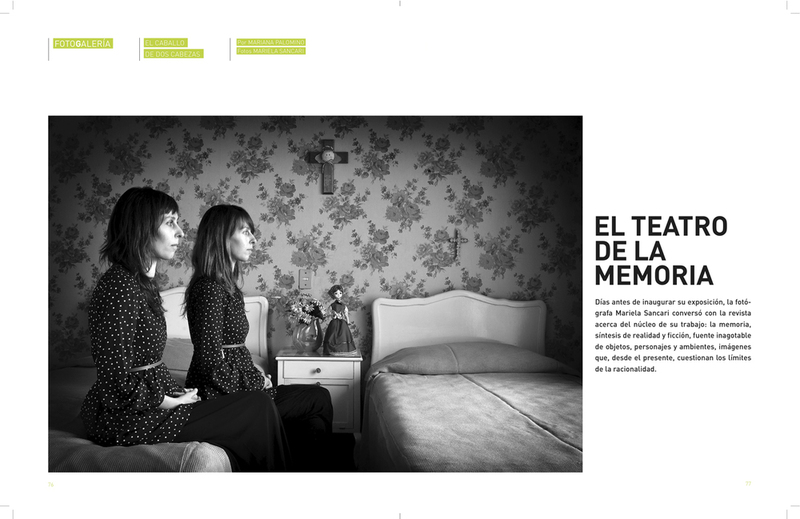 La Membrana Magazine/ August 2012. PDNPulse, FotoFest Standouts, April 17, 2012. Reforma, Culture / Mexico, May 30, 2012. El Informador / Guadalajara, Mexico, August 9, 2012. Reforma, Culture / Mexico, September 27, 2012. La Razón / Mexico, September 26, 2012.